My dad was a huge horror movie fan, I mean huge. My mom not so much so she would have a ladies night every once and a while and leave my dad at home. Sometimes he would have friends over to hang out and watch scary movies. I was a young girl when this started and my dad would give me a choice, I could go up and stay in my bedroom alone or watch the scary movies with him and his friends. I was 5 yrs old mind you when I was given this choice, so at the time I chose to watch the movies instead of stay by myself in my room. I know what you are thinking and yes I was very young to be watching Friday the 13th and Nightmare on Elm St. I agree. The one that scared me the most was Friday the 13th, there was just something as a kid that freaked me out about a guy who stalked a lake and campground while wearing a hockey mask that freaked me out. I ‘m sure I was not the only one. You see I grew up camping and swimming at lakes so I think that is why Friday the 13th and Jason scared me and stuck with me over all these years. 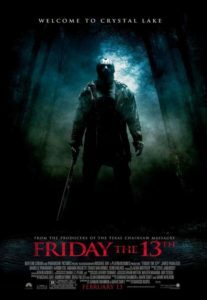 To this day I think twice when I go camping and I will never stay at a lake called camp Crystal Lake, no thank you. Without a doubt the most scariest movie when i was growing up was one of the first restricted movies you actually could not get into under the ages of 18. Normally you grease the usher with the phone number of the cute girl in school and they would see/not see under agers going into restricted movies at the local theatre. There must have been a stern warning before this Steven Spielberg movie was released because we couldn’t get into see it no matter what we tried. Until we found the door to the backdoor of theatre it was showing in. A bunch of my friends snuck in and never wanted to swim in any body of water ever again. 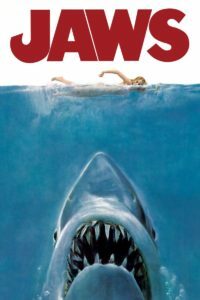 Of courser the movie i’m referring to is JAWS. I didn’t grow up on or even close to and ocean or salt water. Didn’t matter. For that entire summer my friends and I would swim in any local lake, river, or wading pool. We were terrified.